Sub-Saharan Africa is currently facing one of the highest global burdens of disease, while maintaining the world’s smallest percentage of healthcare workers. This statistic, illustrated by the graph released in the World Health Organization’s 2006 Report (Figure 2), highlights the endemic lack of health care workers across the Sub-Saharan landscape. The World Health Organization’s recommended ratio of 2.3 health professionals for every 1000 persons seems an impossibly far cry from the Sub-Saharan norm highlighted by Rwanda’s ration of 0.72 health professionals for every 1000 persons (Cancedda 2014). What has lead to this huge deficit of health workers in the developing world and what has been done to fix it? Current work has focused primarily on confronting the burden of disease that has swept through developing nations, but what about addressing the heart of the issue? Setting up a sustainable system to fight the problem in the future is just as if not more important than attacking current health issues. This disparity in health workers has been attributed in part to the “Brain Drain”, or the migration of graduates from higher education, specifically health workers, from developing nations to developed nations in order to seek better opportunities. Paul Farmer and his organization Partners in Health have illustrated the great work that foreign aid groups can do in aiding nations during crises, however there is little these organizations can do in order to prevent crises. There must be a shift in global health thinking from responsive to preventative, and the best way to accomplish this is by making health care more readily available. The easiest way to create a sustainable system of preventative care is by increasing the number of native health workers. However, to increase local health workers, one must slow the “brain drain” that is pulling these workers away from their countries. Factors that cause this migration of workers have been organized into Push and Pull Factors. Push factors are characterized by strong reasons to leave a country of residence like; limited career opportunities and poor working conditions, whereas Pull factors are those that incentivize movement to another country like; recruitment and better wages (Kissick). This drive to leave Sub-Saharan Africa is best characterized in Figure 3, which shows the percentage of health workers intending to migrate for better opportunities. This statistic is higher than 50% in most nations, and the reason why is clear from Figure 4 which shows the average monthly wages for health workers in developing versus developed nations. Kissick points out that the United Nations Universal Declaration of Human Rights states “Everyone has the right to leave any country, including his own, and to return to his country.” Making the point that in order to stop this migration you cannot ban it, but rather incentivize staying so that health workers will not choose to migrate. How can Developing Nations incentivize their health workers in order to make them want to stay? Higher wages are one idea, but because of the economic situation in many developing nations it is not a valid option. Creating a sense of national pride and the want to stay and help build up your nation is another idea, however one would think this already would have worked if it was ever going to. The responsibility for stopping this migration might not fall on the nations losing their workers at all, but rather on the nations that are recruiting them away. Whichever of these if any are the right answer is not yet known, but what is for certain is that this problem needs to be fixed, or else the health disparities already present around the world will just become more exaggerated. How would you incentivize health workers to keep them from migrating from developing nations? Create a policy that would still allow Health Workers to move internationally, but would keep developed nations from stealing these workers away from developing nations. Cancedda, Corrado. “Enhancing Formal Educational and In-Service Training Programs in Rural Rwanda A Partnership Among the Public Sector, a Nongovernmental Organization, and Academia.” Academic medicine 89, no. 8 (August 2014): 1117-. Fink, Sheri. “Pattern of Safety Lapses Where Group Worked to Battle Ebola Outbreak.” The New York Times (Apr 2015). Connell, J, P Zurn, B Stilwell, M Awases, and J Braichet. “Sub-Saharan Africa: beyond the health worker migration crisis?” Social Science & Medicine 64 (2007): 1876-91. World Health Organization. 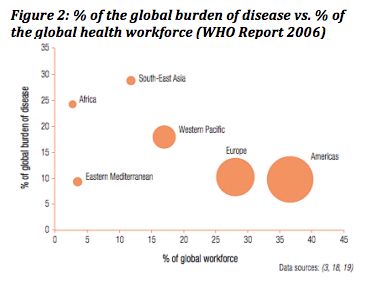 “Working Together for Health: World Health Report 2006.” 2006. Vujicic, M, P Zurn, K Diallo, O Adams, and MR Dal Poz. 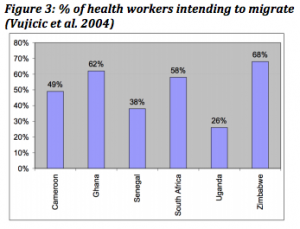 “The role of wages in the migration of health care professionals from developing countries.” Human Resources for Health 2 (2004). I found this to be an interesting read because brain drain is definitely a big problem in the field of healthcare in developing nations. PIH does some work in training community health workers and working alongside them through their programs, but of course, this isn’t enough to make up for the brain drain, especially since these community health workers are only trained to treat a limited number of common illnesses that PIH is targeting. Like you mentioned with the Push/Pull factors, an important place to start when trying to keep health professionals in their native countries is to provide opportunities for high-quality education and research. This presents many problems, however, in terms of funding and infrastructure (e.g., who would be organizing/running the education and research institutions?). To implement such large-scale changes, you would need a government committed to scientific advancement, one that is willing to fund (or obtain funding through working with NGOs and the Global Fund/World Bank, for example, in cases where government funding is scarce) such time- and cost-intensive projects. Although this is a very difficult and long-term goal, I think it is possible with strong and dedicated government leadership. With high-quality education and opportunities in research, I think that developing countries can retain their regional talent. In the short run, however, I think we should make use of the technology that is so readily available in developed nations. The PIH model emphasizes the usage of electronics such as electronic medical records and medical equipment. Along similar lines, there should be more widespread promotion of Supercourse, an online forum where researchers and healthcare professionals share their knowledge globally. This poses the problem of needing to make sure there is reliable internet access and means of accessing the internet (i.e., computers) for health care workers in developing nations to be able to use Supercourse. But this is just an example of a network that already exists for health workers in areas without medical schools or higher education and research facilities to learn from other professionals around the world. With the advent of technology as well as the pattern of globalization, it has become increasingly easier to connect with colleagues across the globe. So for health workers studying/working abroad, there should be more opportunities for collaboration with their native countries. The way I am envisioning this, NGOs would work with foreign professionals to develop education programs and engage in health-related research with colleagues in their home country, as well as transfer innovative technology to their home country so that the collaboration can continue via the internet. Utilizing technology would allow health professionals to migrate to another country as they wish, while still contributing to the education and knowledge in their home country. I realize this all sounds idealistic, but I really think there needs to be training/education opportunities, research opportunities to make discoveries and advancements in medicine, a network of supportive colleagues in the scientific community and beyond, and a way for health workers to be recognized and compensated for their accomplishments in order to motivate health professionals to stay in their native country instead of moving to developed nations. I definitely appreciate your idealism. I agree with your idea that the best way to keep health professionals in their country is to create an environment that any health professional would want to find themselves in. One with greater prospects for higher education, the latest equipment with which to treat patients, and prospects for career growth. Creating this environment is no small feat as I am sure you know. I think fixing this problem will come down to a “right place, right time” situation, where a country finally feels it is necessary to address this problem head on. Yes, I agree with you that there needs to be the “right place, right time” situation for the country’s government to put its efforts and funds into creating an institution of higher education and research. I think NGOs could help “convince” the government that such resources are necessary by pointing out the push/pull factors that are causing the brain drain from the country and then collaborating with the government (probably with the help of funding from International Monetary Fund or World Bank) to develop these institutions for further career development. I found your concept of addressing Push and Pull Factors as a pathway to improving global health quite interesting, and I think your discussion leads to this larger question of how to prioritize work in global health. To some extent, it is vital to treat the disease because direct intervention undoubtedly reduces the burden of disease. Additionally, some may argue that addressing poverty, gender paradigms, and living conditions will only truly reduce health disparity. And, as you argue, others assert that building health care infrastructure is important too. In my opinion, if we do choose to focus on health care systems and incentivizing health care workers, I think governmental involvement is paramount. As we discussed in lecture, medicine, improved health education, and arguably even personal impetus of healthcare workers to improve their own country does little to fix labor and health policy; the most such interventions can do is make living under inequality more bearable. The best way to address the “push” factors is to have a government that is invested in making healthcare change. For instance, in Rwanda, the government had strong ownership of health problems, and thus the Health Ministry was bureaucratically convinced of change. Foreign aid (i.e. PIH) then became a vehicle for that transformation to occur through enhanced formal education and in-service training programs. Therefore, I think it is important to ask how one can alter “push” factors and incentivize health care workers where political infrastructure is incapable, unstable or un-invested. Is it possible to provide apolitical global health work (especially when the largest burden of disease may lie in countries with little government involvement in health care)? I do believe that it is possible to provide apolitical global health work citing doctors without borders as my example. By solely looking at disease burden and trying strictly to address it on an individual basis, as doctors without borders has successfully done, I do believe that it is possible to stay apolitical. However, I believe that it is impossible to maintain this apolitical position when trying to address the push factors that drive healthcare workers out of their countries. Even PIH’s motivation that healthcare is a human right forfeits their status as an apolitical entity. For this reason I believe addressing these push factors is an entirely political matter. Government stability and funding for better health education and health resources I think are what will diminish this push. Hi Steven, I think we are on the same page with our positions on the political nature of making sustainable health care change. I wonder if then that means that impacting push factors necessitates a strong national government and ministry of health (perhaps like we saw in Rwanda). If so, I think “Brain Drains” are inevitable in the initial stages of global health intervention. However, as you addressed in your blog, global health work requires a “shift from responsive to preventive.” As participants of global health change, our recognition of this should inform our health approach as one with diagonal mobility towards sustainability (via education, community involvement, in-service training, etc.). I appreciated the post for facilitating these conversations. I really liked how you addressed the fact that healthcare workers and their current work is focusing on dealing with a current crisis rather than focusing on a more longer term fixes. I completely agree with your point of switching healthcare from responsive to preventive. I also really agree with your the point you made about recruiting nations being at fault for health care workers leaving their home nations. For you first question, I think we should focus on incentivizing health care workers to stay. I know you mentions increasing national pride which I believe could play a huge role. The government could help indefinitely with the promotion of nationalism. I’m sure nations have been doing this and there are many underlying factors to fix in order to keep health care workers in their original nation. I also know that a fix for this issue is very hard to address and that just fixing nationalism isn’t going to cut it. I do think that this is the best place to start though. For your second question, I not entirely sure a policy can be made that is abides by the United Nations Universal Declaration of Human Rights “Everyone has the right to leave any country, including his own, and to return to his country.” I don’t think a policy should dictate when a person leaves or returns to their country or for how long. Hopefully we find a solution to the problem of healthcare workers leaving. Hi Steven! You did a really nice job clarifying the causes of the “Brain Drain” in certain countries and the effects this has on these countries. It is a tricky problem, because people who are able to complete the education and training needed to become doctors are likely to have outer connections and more resources, so they are more able to relocate if doing so improves their conditions. In regards to your first question, trying to increase access to education within a country may help stop some of the “Brain Drain.” Not only will this make education more accessible, but if people are educated and trained to the context of their country, they may be more likely to stay and try to address the problems faced by this country. I do not think it is so much a problem of developed countries stealing health workers, but health workers moving to better opportunities to improve their lives. However, if education is available locally, people can put this into action locally. Hey, Steven. I really appreciated your post and perspective on the topic of Partners in Health, and more specifically, the Brain Drain. As we’ve discussed extensively in class, and as you mentioned yourself, the problem is difficult when faced with a huge burden of disease. Is it morally right to build a hospital when you could be spending funding on more immediate solutions, that save people right now, in the current moment? I definitely don’t know the answer to that. I agree wholeheartedly with your solution to incentivize staying through education and research. Additionally, another comment on your post mentioned the importance of ‘educating and training individuals in the context of problems in their own country’. This specific education may be a big ‘push’ factor that drives brilliant minds to stay — one that outweighs the ‘pull’ of other countries, like recruitment and better wages. I also think that you cannot truly end the Brain Drain unless you invest in sustainable healthcare solutions, that provide the groundwork for a more sustainable future. I think PIH, by creating new clinics, is inherently part of that solution — but a stronger solution will come from the place itself. Great post! I was really glad to see that you brought up the brain drain because it is indeed a very troubling problem that I think at times is overlooked. I definitely agree with what a lot of my classmates have said in response to incentivizing health workers to stay: education is key. The specific policies through which one would strengthen education are tricky. On the one hand, an encouragement of more public-private partnership between medical schools in developing countries and private western companies would allow for a lot more funneling of funds into medical schools. However, as we have learned in lecture and from the readings, the application of neoliberal policies of free market trade to global health services may work well initially, but in the long-term only alienates the state further from its citizens, making it even less accountable to its citizens’ health. Thus I think that ultimately, the best policy would be to have philanthropic donors donate money to the government that will be targeted specifically towards strengthening and expanding medical schools in developing countries. Exactly how one can ‘strengthen and expand’ a medical school is another multifaceted question. To begin with, one thing we take for granted in the US is that all medical schools have an ‘Office of Resource Development’ or an ‘Office of Advancement.’ Many medical schools in developing countries do not have such offices. Therefore, investing the money into building a Development Office for the medical school would definitely be a step towards the medical school finding more donors and having increased access to resources. Wow, fantastic post Steven. I hadn’t really considered addressing the health system needs of a nation by creating better incentives for health care workers to stay. I agree that it would be unethical to decrease their opportunities to leave, but without a major overhaul of economic and structural reasons for the inequality in the first place, it is hard to really think of a way of restructuring the system to make such incentives sustainable. You could, in forming a research and training partnership like PIH did in Haiti and Rwanda, create high-paying positions with unique research opportunities for those that stay at home. Alternatively, resources could be directed towards local governments to create their own incentive structures. The problem is this might be putting healthcare workers at too high of an advantage, relative to their peers in other technically complex and socially important roles. However, given the need, this might not be that terrible. Beyond better pay and unique professional opportunities, working on establishing national and professional pride might also be viable. I wonder if changes to early education which implement these attitude changes could be effective. Thank you for bring up this important point. I am very interested in the question because I have read about doctors who were born in developing countries but set up successful practices in developed countries. They were generally very lucky to have such career paths, as well as the opportunity to pursue a better quality of life for their children in the United States. All of the incentives were there for them to leave. I don’t have a ready answer, but I do think that it is important to establish better local health facilities and train local community health workers. I wonder whether we could look at developing national programs that trained local people with the expectation that they return to their community to provide health care. I was in Chiapas, Mexico, last summer on a school trip visiting some Zapatista communities, and they did something very similar. Remote communities sent envoys they wanted as doctors to “caracoles,” or centers of government, where they would be trained. This not only provided a valuable trade to the chosen individual, but also an invaluable asset to each community within the region. Thanks so much for this thoughtful post! 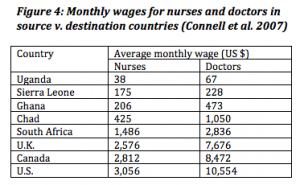 I think one of the greatest issues that contributes to brain drain is simply the difference in wages a doctor receives in a developing country and in a developed country. Honestly, I am not sure how we can really change this–physicians are one of the highest paid professions in the US, and while they might be a higher paid profession in developing countries, the raw numbers of wages can’t even compare. I don’t fully agree that developed countries are really “stealing” physicians away from developing countries–I do however agree that many factors contribute to the brain drain of physicians, and we must do something about it. I think it would be great to train local people to be health workers. They could be trained to deal with specific illnesses and infections that are less severe and then learn to recognize when they should refer patients to a certified physician. While there would still be a lack of physicians in the country, by incentivizing people to work in a primary health care system, we could improve overall health. These local health workers should be valued, and their wages should reflect that so that people actually feel the desire to become health workers. Thanks again for your ideas! They were really thought provoking! I really appreciate you writing on the issue of ‘brain drain’ as it is definitely a factor that influences healthcare systems around the world, especially in sub-Saharan Africa. Back home in India, I have seen several trained doctors, including folks in my family migrate to the US as there are more lucrative opportunities to be found here and the infrastructure available is also much better. To add to your discussion, I think that another facet of this problem is that it disproportionately affects rural areas (for the very same reasons mentioned above). For instance New Delhi has an abundance of hospitals both public and private which attract doctors from all over. However, if you travel to the villages of Rajasthan which are less than 150 miles away, you will find that there are no resident doctors to be found. Instead, there might be a doctor who visits the village once in a week or two. Keeping this in mind, I feel it is important to decentralize medical schools and hospitals. Also, as Jacob suggested in his comment, cultivating a sense of community and professional pride amongst doctors is important in order to retain them. Towards this end, I think establishing region-based and national societies of medical professionals might be helpful. Partnerships between national and international educational institutions, NGOs, etc. are also needed to improve and provide opportunities for higher education and research for the many reasons that comments before mine have highlighted and the same goes for infrastructural advancement. This phenomena certainly presents many challenges and needs more attention than it is given at present in relation to healthcare.